Food | Let Teddy Win! 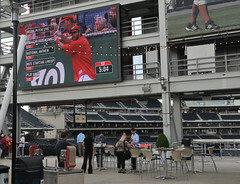 Washington Nationals fans and players gave several changes to the Nationals Park experience a test run on Friday as the Nationals played the first of two preseason exhibition games against the Minnesota Twins in advance of Monday’s season opener in Atlanta. Among the most talked-about changes was the new safety netting strung from section 116 to 129 above the team dugouts (I previously wrote about its anticipated impact on the fan experience). Fans behind the dugouts, who had enjoyed eight seasons of unobstructed interaction with players, will now view the game from behind a high protective net. An informal survey of fan reactions ranged from “awful” (from fans in the first few rows) to “not as bad as I thought” from fans who sit further back. At its debut Friday night, the net certainly caught both fans and players by surprise. Many children behind the dugout followed a tradition of bringing baseball gloves to the game, and — oblivious to the net between them — screamed for players to toss them a ball at every half inning. Sadder still, a few players throughout the night forgot and tried, leading the ball to either bounce back onto the field or fall into the dugout. Old habits die hard. Between innings, Nats fans will find that in-game host Michael Ploger has been replaced by a fresh young face named Derek. Ploger moved on to a new career as a sports reporter. As part of a new sponsorship deal with Anheuser-Busch, the former Miller Lite Scoreboard walk has been rechristened the Budweiser Terrace. On game days, from the time the gates open until 30 minutes before first pitch, beers at the Budweiser Terrace bar will be $5. Food concession changes for 2016 are relatively few compared to previous years. The always-crowded Shake Shack on the terrace has been doubled in size, taking over the adjacent space once occupied by sister chain El Verano Taqueria (El Verano moves to a small freestanding kiosk nearby). 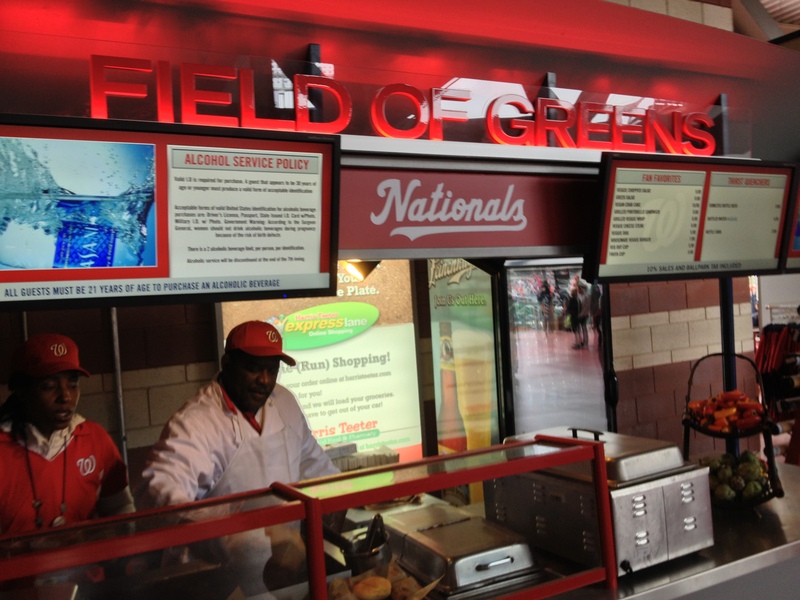 The Nationals’ off-season “pitch your product” contest resulted in two new food concessions. 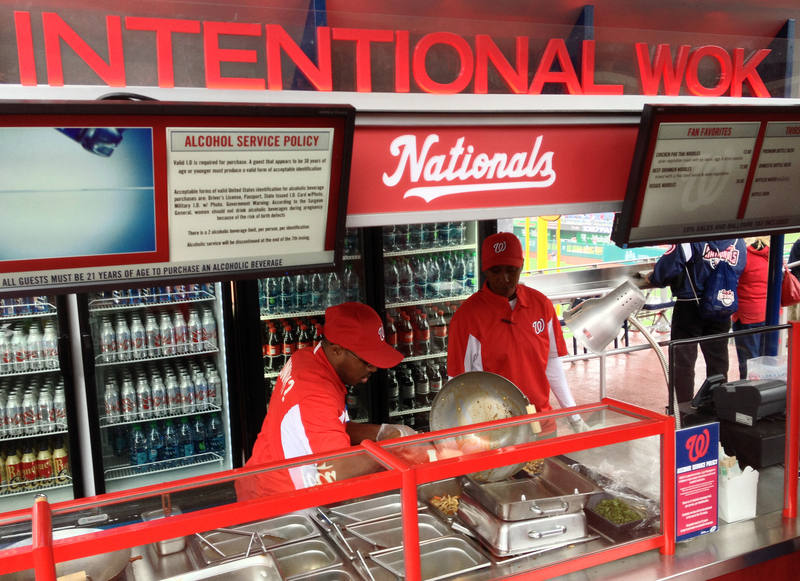 On the main concourse behind left field, Haute Dogs and Fries replaces original Nats Park vendor Hard Times Cafe. Goodbye Cincinnati Chili. Hello hot dogs with toppings like New York Reuben and Vietnamese Banh Mi, plus lamb sliders and tater tots. 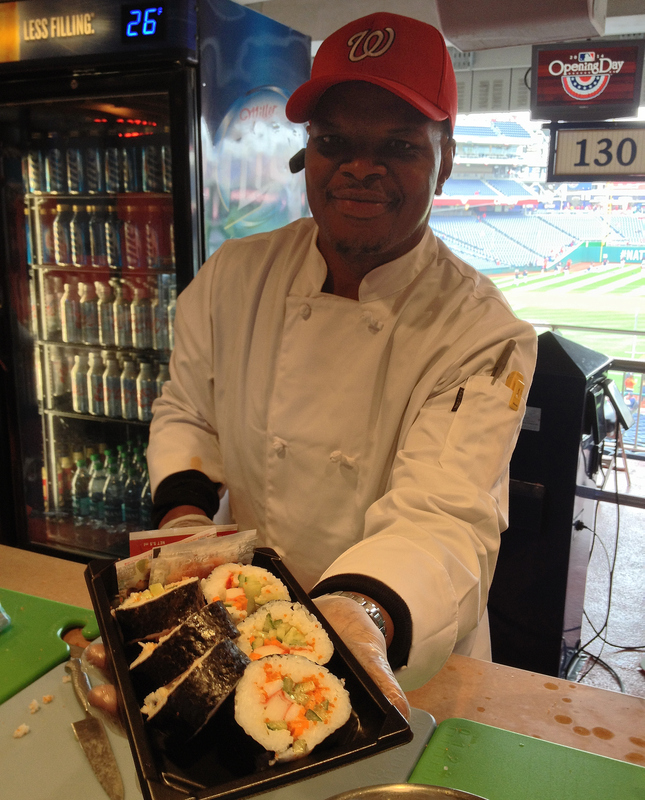 The other local winner, Pinch Dumpling, is up on the Gallery level, as part of a conscious effort to bring more exclusive food items to the fans in 300- and 400-level seats. The steamed or fried beef, pork, or vegetable dumplings should be a welcome addition, though I’m worried that with a price of $10 for six dumplings, its location behind the $5 Grandstand seats might not be the smartest real estate decision. Across from Pinch, two new concessions by DC restaurateur Mike Isabella are expected to open on April 7: Catchfly will feature Southern-style food such as ribs, coleslaw, popcorn chicken and waffle fries. Kapnos at the Park will have gyros, falafel, cheese steaks, fried Greek potatoes and hummus. Wondering where your jerk chicken went? After two seasons next to the Nationals Park Kids Zone, Jammin’ Island BBQ has moved back upstairs to a cart next to the Bud Light Loft. Its previous location will be something called “MLB Knockout,” presumably an extension of the Kids Zone. Nursing mothers at last have an air conditioned private lounge at Nationals Park that even includes play space for toddlers. The new Lansinoh Nursing Mothers Lounge opened late last season and is located on the mezzanine at section 223. Splurging for PNC Diamond Club tickets? 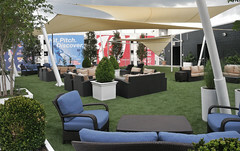 A complete renovation of exclusive dining area and lounge behind homeplate has dramatically expanded its capacity. The facility was stripped of most baseball memorabilia and expanded to two levels that appear to be jam-packed with chairs and tables. The expense account crowd might feel a little more like cattle with this new setup, but they’re more likely to find a table during rain delays, and the club seating no longer extends to a tent outside the stadium. For kids of all ages, a new pin trading station has been installed near section 138, where hundreds of pins can be purchased or simply traded, Disney-style. Finally, the Nationals promised better selection and pricing at the Team Stores in 2016, and what better way to expand selection than by introducing a whole section filled with racing president souvenirs. Racing president blankets, racing president patches, racing president hats and t-shirts, racing president magnets, racing president banners, and stuffed presidents are but a few of the souvenir items featuring George, Tom, Abe, Teddy, and Bill. 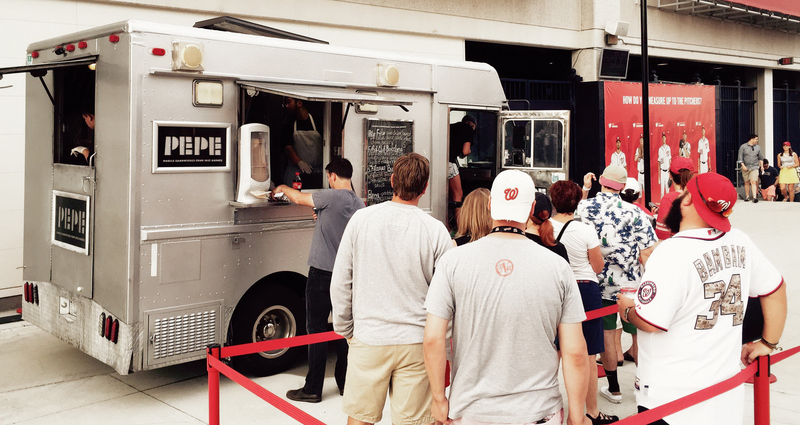 The Nationals’ debuted another new local food option for fans at Nationals Park with the introduction of Pepe Food Truck by celebrity Spanish chef José Andrés. The truck, named “favorite truck in all of Washington” by Washingtonian Magazine, made its debut inside the right field plaza outside the new team store on Friday night. 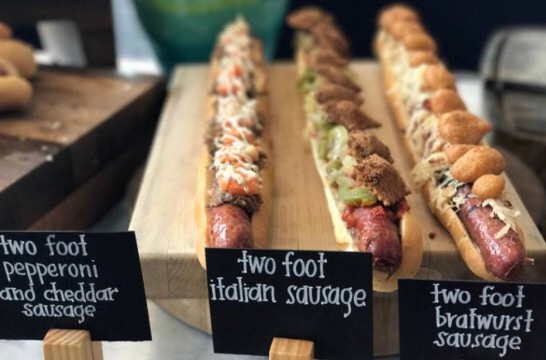 Like the popular celebrity sandwich stand G by Mike Isabella on the first base side of the concourse, the small menu features a handful of premium-priced sandwiches with gourmet ingredients. Pepe by José Andrés stands out from other food options at Nationals Park in three significant ways. First, unlike other sandwich stands in the Park, the sandwiches here are served piping hot. 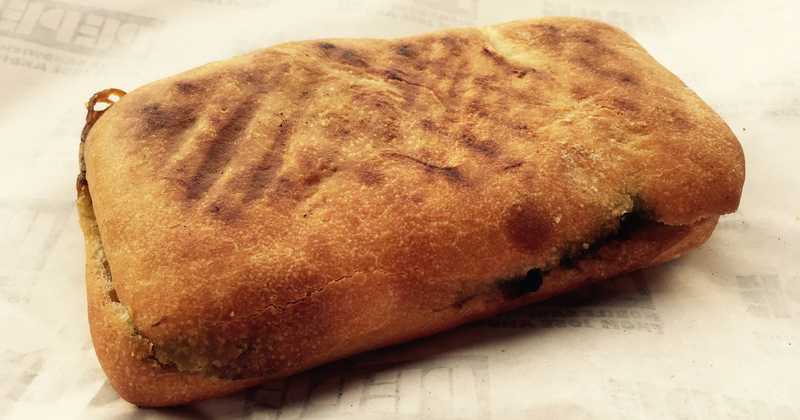 On Friday night, even after a long walk back to the opposite side of the stadium, our sandwiches were hot and toasty, but a welcome departure from the typical pre-made sandwich or frigid bun. Second, the menu will not be fixed. 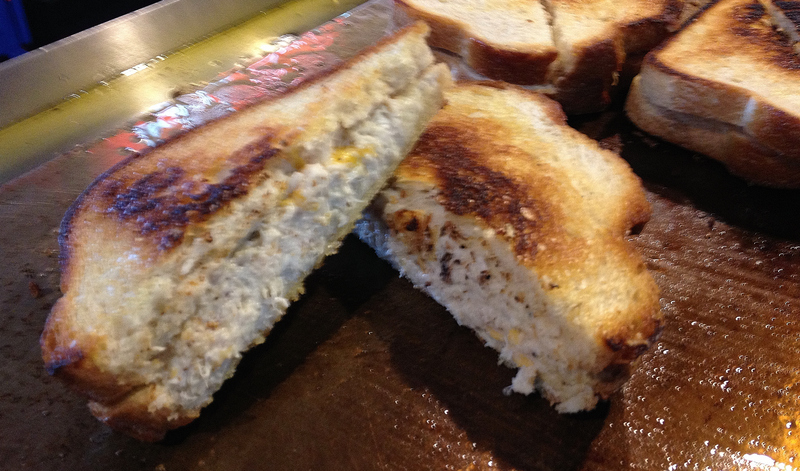 On Friday night, the four sandwiches included a spicy fried chicken sandwich, a confit chicken breast sandwich with bacon, a rich “sausage burger”, and a dynamite vegetarian sandwich with portabello mushrooms and carmelized onions on a delightfully crispy bun. Finally, you won’t find Pepe Food Truck at every game. In true food truck fashion, you’ll have to pounce at the opportunity when you see it, because it may be gone the next minute. Pepe won’t be at Nationals Park on Saturday, but they’ll be back for Sunday’s series finale. The Washington Nationals announced that the long-awaited opening of the new flagship Nationals Park team store will arrive Tuesday night as the Nats open a homestand vs. the New York Yankees. Also opening Tuesday is the newest locally-themed concession, Virginia Country Kitchen, behind section 113 on the 3rd base side, serving buttermilk biscuit sandwiches, house made kettle chips, and Virginia-made beverages. The new team store on the centerfield plaza has been under contruction since before the 2014 season, and will be more than double the size of the former flagship store across the plaza. That location will eventually be turned into a restaurant. After Bryce Harper’s walk-off home run Saturday, fans watched as pitcher Max Scherzer doused the outfielder with chocolate syrup, a ritual Scherzer created this season as an alternative to the traditional shaving cream pie in the face. Beginning Sunday at Nationals Park, any fan can have the opportunity to reproduce the feat, perhaps even as a means of summoning another walkoff. 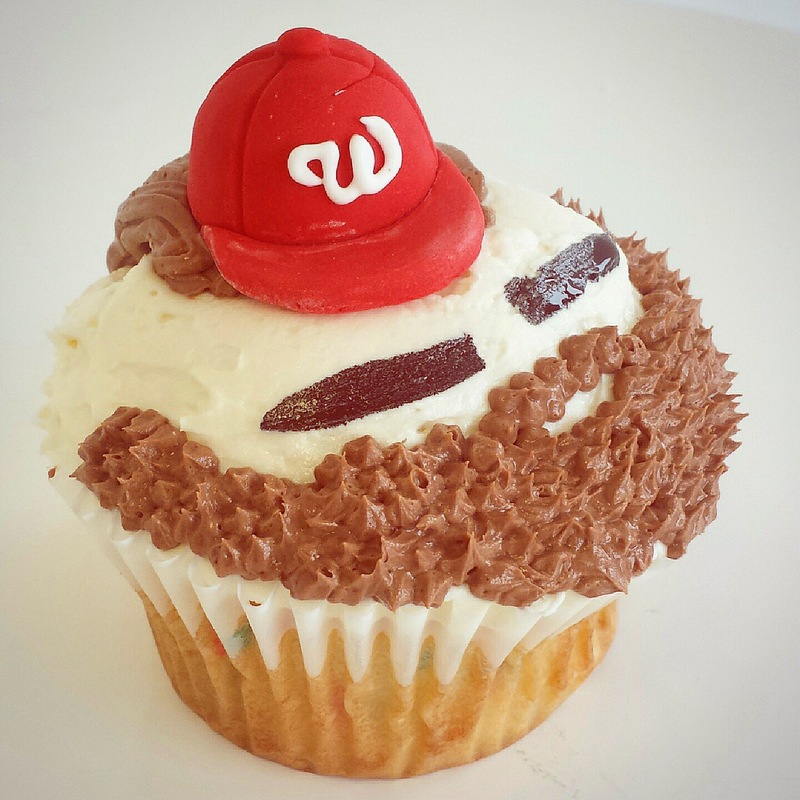 The exemplary bakers at Fluffy Thoughts Bakery, known for the Teddy Roosevelt and Jayson Werth cupcakes they sell in their stand behind section 135 at Nationals Park, are introducing the HarpCake, a “funfetti” cupcake topped with vanilla buttercream and chocolate, complete with an edible fondant hat plus brohawk and eye black. More importantly, anybody purchasing one of these little bundles gets to douse it in all the chocolate syrup they want. Demonstration video below. 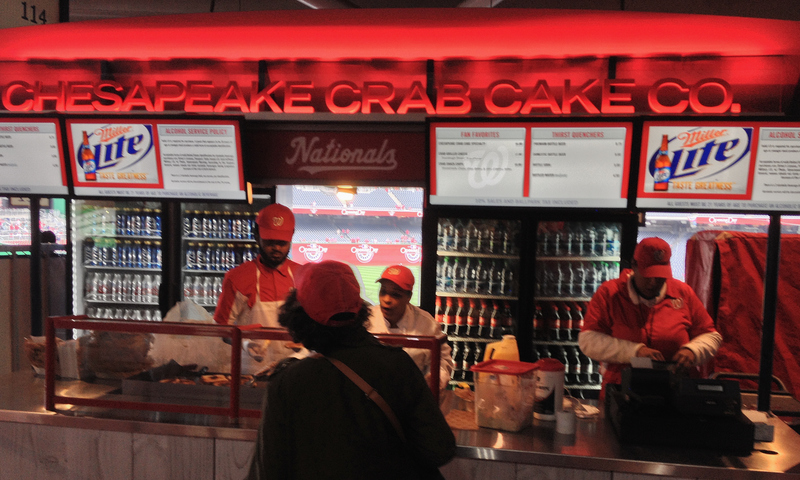 The HarpCake runs $6.50 at the Fluffy Thoughts stand behind section 135, while supplies last. And by the way, the cupcakes are outstanding. 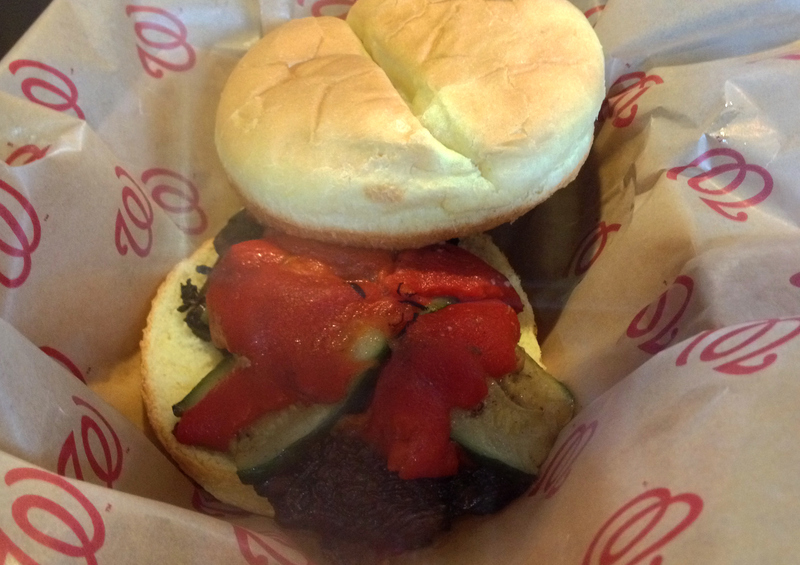 The Washington Nationals unveiled more than a half dozen diverse new food options to Nationals Park fans on Friday, and the early buzz was almost universally positive, despite several stands selling out of signature items. 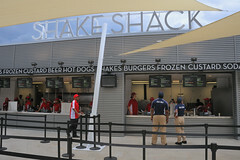 In previous years, many of the stadium’s ethnic and “upscale” offerings had been isolated to the Scoreboard Walk and restricted Club level, but the newest concessions have brought more variety to the main concourses where most of the park’s foot traffic occurs. 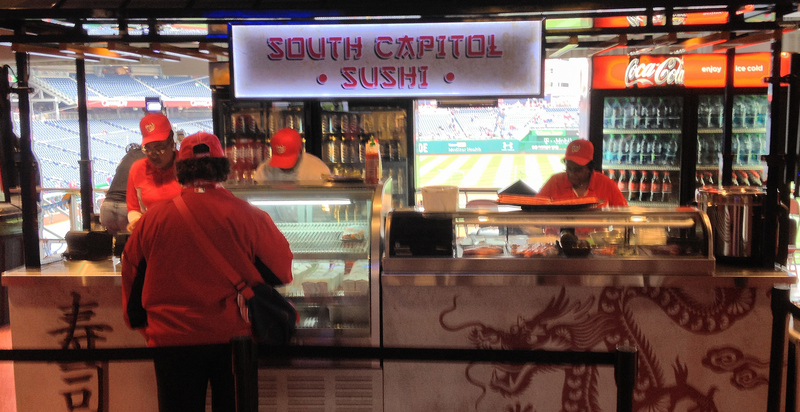 Directly behind the Nationals’ dugout boxes at Section 129 is a new stand called South Capitol Sushi, where maki sushi is rolled to order. Selections include vegetarian and cooked options, but bright, fresh raw tuna and salmon were on hand to be sliced to order for the spicy tuna and salmon avocado rolls. As a bonus, at $8.00 each, they looked to be a relative value considering the quality of the ingredients on display. 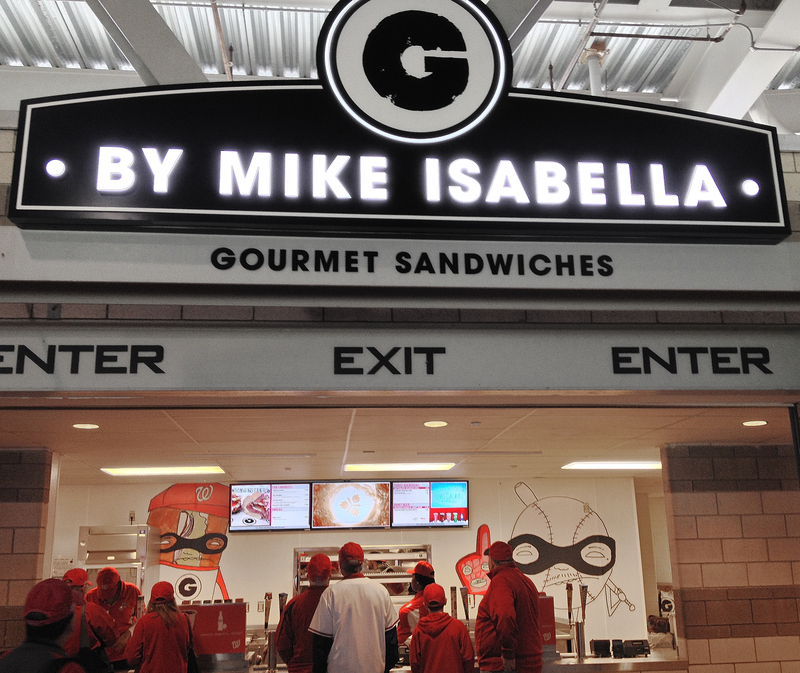 Lines were forming as early as 11:00am at the new Nationals Park outpost of “Top Chef” celebrity Mike Isabella’s G Gourmet Sandwiches behind section 136 along the first base line. The trimmed-down menu features five items from the 14th Street restaurant, including a hot chicken parmesan sub that was drawing raves in the stands, a delicious but very messy hot roasted cauliflower sub with romesco and pickled vegetables (extra napkins required), a cold stuffed Italian hero, and the eponymous “Drewno,” a delicious (if pricey) house-made kielbasa with sauerkraut, named not for the Nat’s reliever, but for Chef Scott Drewno from DC’s The Source. 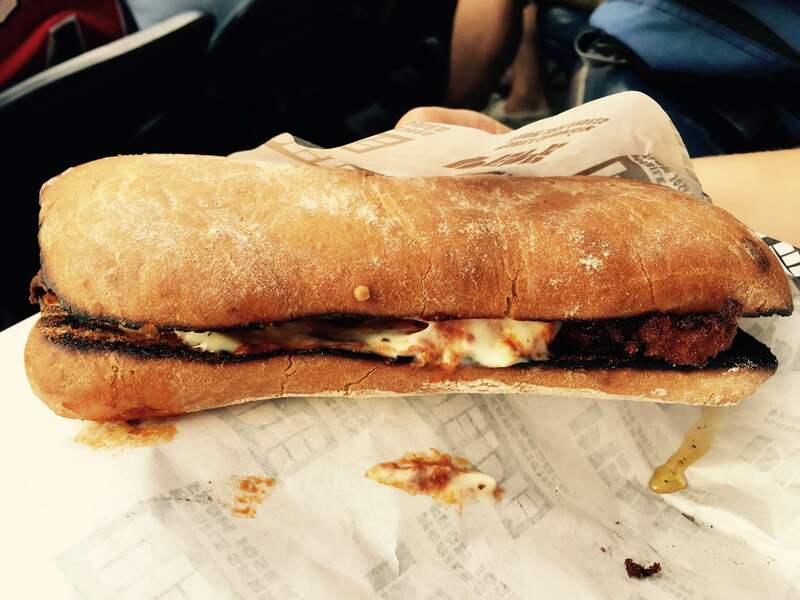 If you’re hungry, the G Italian hero is easily the largest sandwich served at any of the Nats Park stands. The Italian meats are high quality, but they are inexplicably dressed not only with oil and vinegar but also mayo. The sandwiches were so popular that Isabella, who was on hand for opening day, ran out of food and had to shut down the stand by the fourth inning. On the third base side of the main concourse behind section 114 is the new Chesapeake Crab Co., offering a simple menu of crab cakes, a crab grilled cheese with brie on sourdough, or crab “snack chips,” an upscale take on nachos featuring Old Bay kettle chips, crab queso, roasted corn and tomato salsa. Vegans, vegetarians, and those looking for healthy options will welcome the new Field of Greens food stand behind section 113 on the third base side. 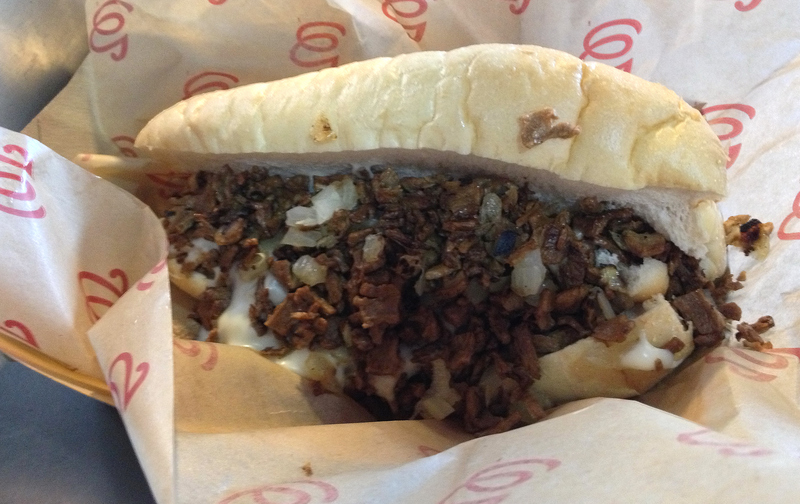 The extensive menu includes cold salads, vegetables and fruit, plus a number of soy-based imitations of more traditional ballpark food, such as burgers, hot dogs, and even a cheese steak. 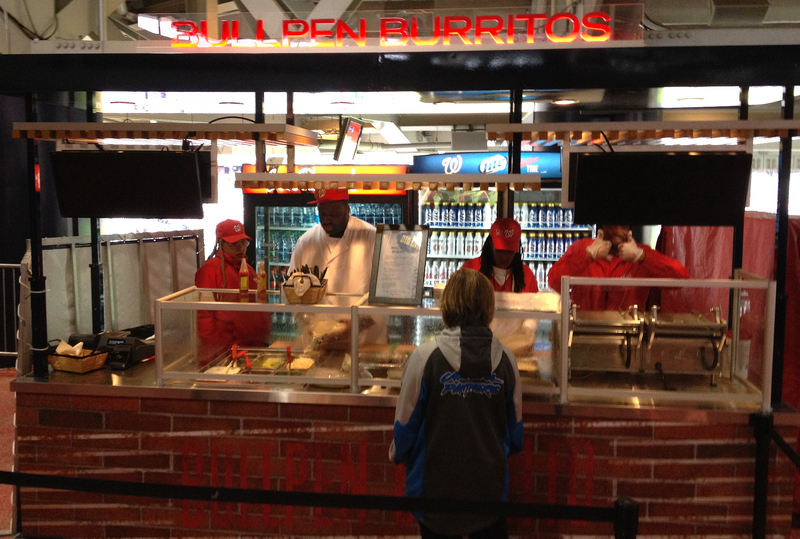 Burrito fans can herald the return of Bullpen Burritos to Nationals Park. Bullpen Burritos was a fixture at the stadium when it opened in 2008, but the stand disappeared in 2010. 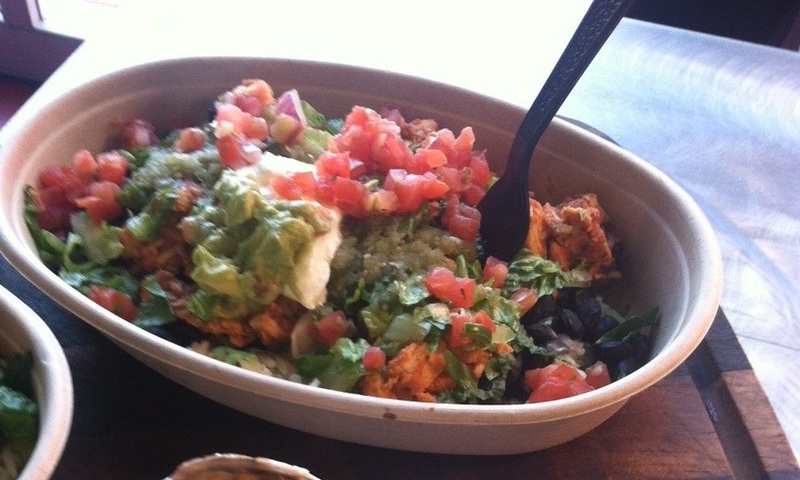 Now it’s back, featuring made-to-order steak, chicken or vegetarian burritos and burrito bowls, with a choice of toppings including rice, beans, guacamole, roasted tomatillo salsa, and pico de gallo. 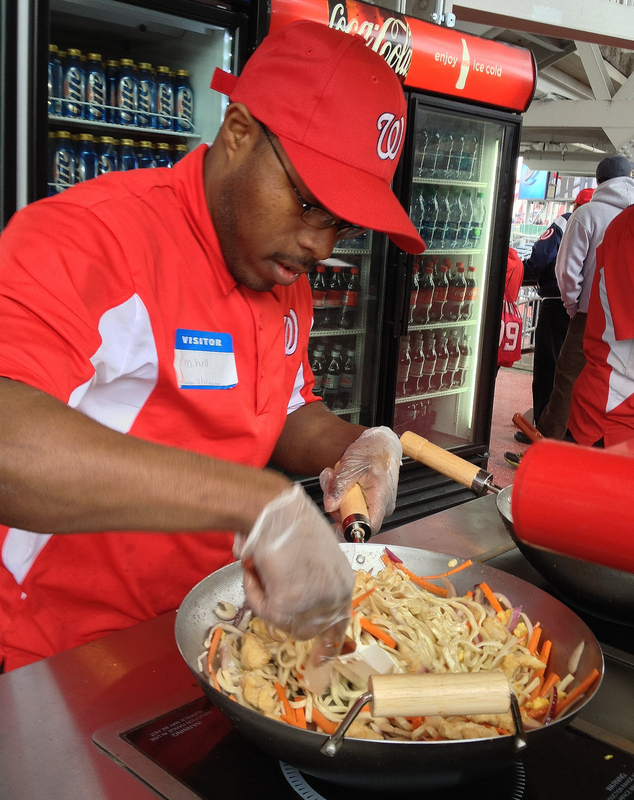 Fans up on the 200 level can now add a thai noodle stand, including vegetarian option other than the Shake Shake ‘Shroom Burger, to the popular food choices along the Scoreboard Walk. Intentional Wok can be found behind section 233, and offers a simple menu of pad thai, drunken noodles, or veggie noodles, all cooked by batch in woks and served in classic takeout food containers with chopsticks. And it doesn’t stop there. 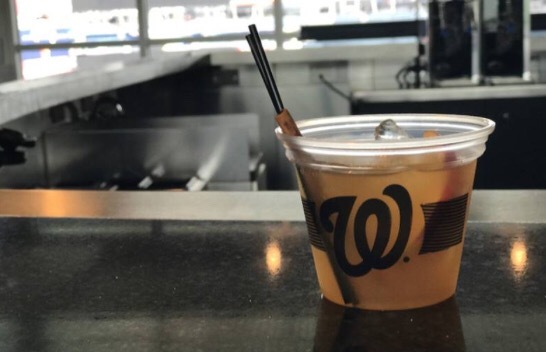 The Nats added another location for Ben’s Chili Bowl behind section 141, and adult beverage choices also received an upgrade, with two new carts serving local craft beers that will change throughout the season, plus several new outposts (near sections 113, 130, and 306) offering pre-mixed cocktails with barrel-aged bourbon. 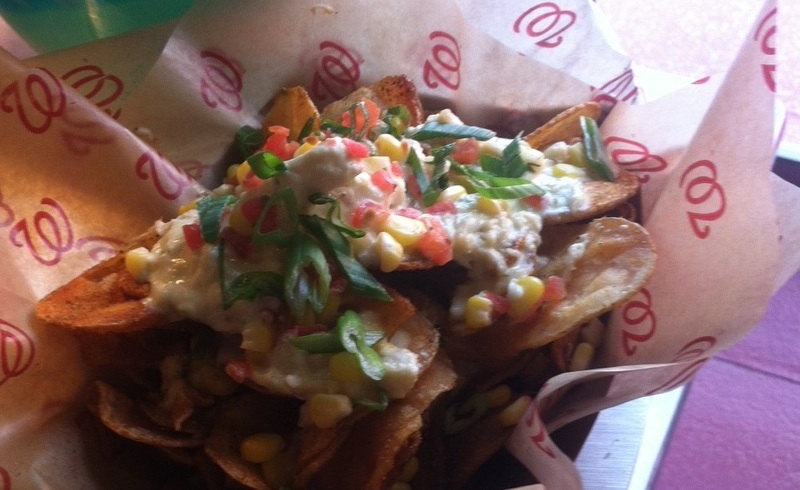 To be clear, there have been good food options at Nationals Park for years. 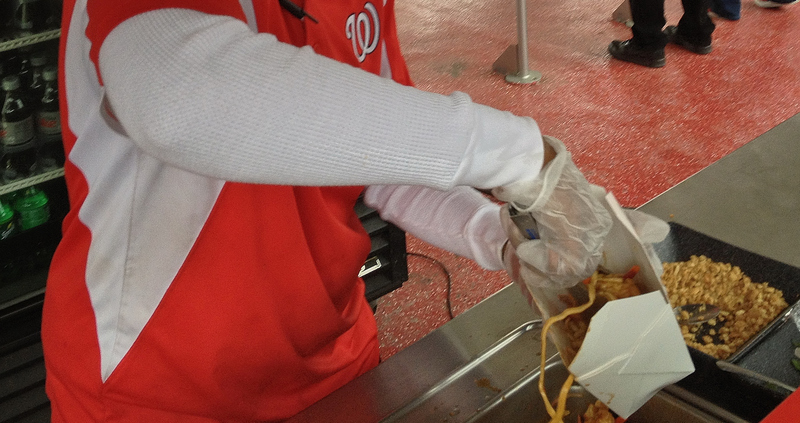 If you haven’t had Ben’s Chili Bowl Half Smoke, you haven’t had the full Nationals Park experience. The shawarma and falafel at Max’s Kosher Grill behind section 143 continue to be the sandwiches to beat in the stadium (but being strictly kosher, they are not open on Fridays and Saturdays). Jammin’ Island Barbeque makes great jerk chicken and ribs. Hard Times Cafe Cincinnati chili still warms the soul on cool evenings (and has the fastest service in the park), and Fluffy Thoughts Bakery behind section 135 is the undisputed dessert king. 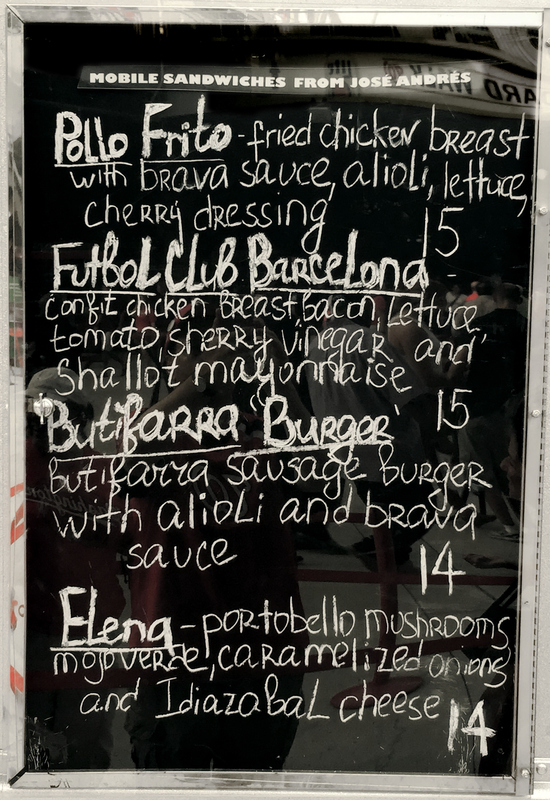 The Scoreboard Walk restaurants from Union Square Restaurant Group (Blue Smoke, Shake Shack, Box Frites, and El Verano) remain incredibly popular, and the team’s outside food policy is still the best in professional sports. However it’s safe to say that until now, interesting and healthy food options for the average fan remained the exception in a sea of bland burgers and chicken fingers. The plethora of interesting new options should help both attract more fans and smooth out the lines at all of the food stands throughout the Park. So what have you tried and what do you recommend? 26,759 fans came to Nationals Park Tuesday to welcome the home team back to DC, and the evening didn’t disappoint as the Nationals followed their winningest road trip in years with a thrilling come-from-behind victory over the St. Louis Cardinals. Fans had been drawn in by the return of Ryan Zimmerman, a $2 ticket promotion, great weather, a big draw opponent, and the long-awaited debut of the revamped Miller Lite Scoreboard Walk behind the right field bleachers. The sails stretch over the lounge area as well as the queue lines for each of several new dining options, providing sun protection when waiting in line on hot summer days. These new lounge and queue areas are all within view of the big new TV screen that premiered this season behind the outfield scoreboard. As nice as the improved amenities are, the buzz on Twitter and in the Park tonight focused on the four new restaurant options that line the Scoreboard Walk. 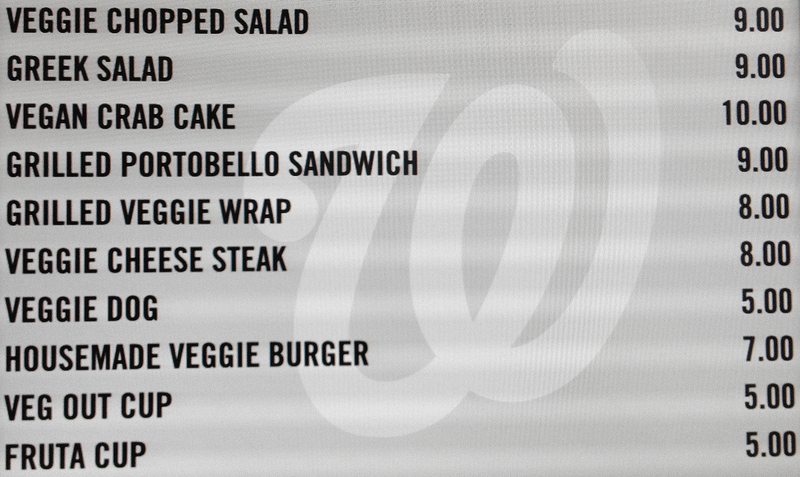 After tonight’s debut and a sampling of all the menus, it’s safe to say that Nationals Park food options rank among the best in the majors, albeit at some fairly steep prices. No stand was more anticipated than Shake Shack. 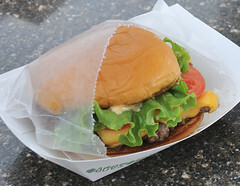 The most famous of the four new options from Union Square Restaurant Group, Shake Shack features hot dogs, fries, shakes, and natural Black Angus burgers. The burgers live up to their reputation, with a nice coarse grind that highlights the flavor of the meat more than the predecessor at the same location — DC’s Five Guys Burgers and Fries. A single is $5.75 and a double runs $8.75. Shake Shack also features the Shack-cago Dog, a mostly authentic Chicago-style split grilled Vienna Beef hot dog smothered in relish, onion, cucumber, pickle, tomato, pepper, mustard and celery salt. If you’ve never had a Chicago dog, this is pretty close to the real deal, though Shake Shack opts for a potato bun over the traditional poppy seed variety. It’s a bargain at $5.75. The sleeper and my personal favorite of all the new food options may be the ‘Shroom Burger, a portobello mushroom split and filled with muenster cheese, deep fried, and served on a burger bun. Truly decadent and delicious for $7.75. For the first time since Giffords Ice Cream left Nationals Park this spring, fans can get once again get a milkshake in the stands at Nationals Park. 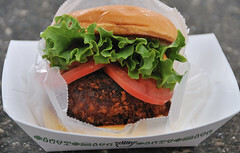 Shake Shack’s namesake treats are made from frozen custard and come in four flavors. 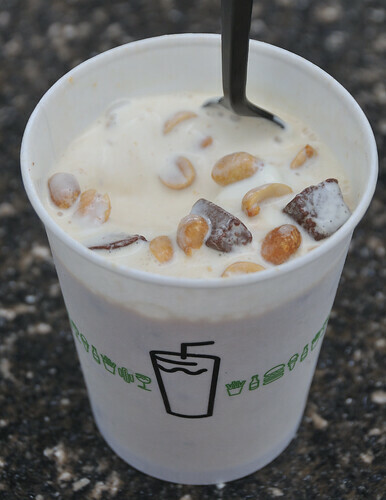 At $5.75, the shakes are indeed quite good, but the buzz was around the Concrete, a dense cup of custard blended with chocolate truffle cookie dough, peanuts, and caramel. A straw will do you no good with this concoction. Price: $6.75 plus a week at the gym. 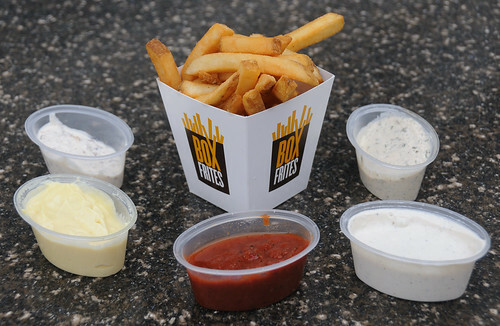 Shake Shack has fries on the menu, but spud connoisseurs will likely shuffle down a few feet to Box Frites, where fresh cut fries can be ordered by the box with your choice of toppings or dipping sauces. The movie theater-inspired pricing gets you a reasonable-sized portion for $7.25, or a family-sized box for $8.00. You only get to choose one of the five dipping sauces (additional sauces are a whopping $2.00 each). Blue Cheese was the surprise runaway pick among our group of tasters. Chipotle ketchup is a fine second choice. Rosemary Ranch, which sounded promising, tasted like liquid pine tree. 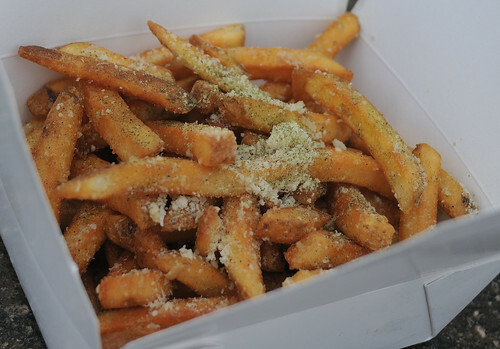 But for the ultimate in decadent fries, the consensus pick is the Garlic-Parmesan Frites, which are light on the garlic but heavy on the parmesan, and more than suitable for sharing at $9.75. If cholesterol just isn’t your thing, then the new El Verano Taquería offers some fresh options and more welcome variety to South Capitol Street. The simple menu features three types of tacos served in soft corn tortillas with lime, cilantro and fresh salsa. 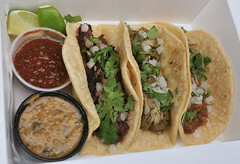 Options include medium rare skirt steak, carnitas, or chicken “mole pipian,” a braised green concoction. 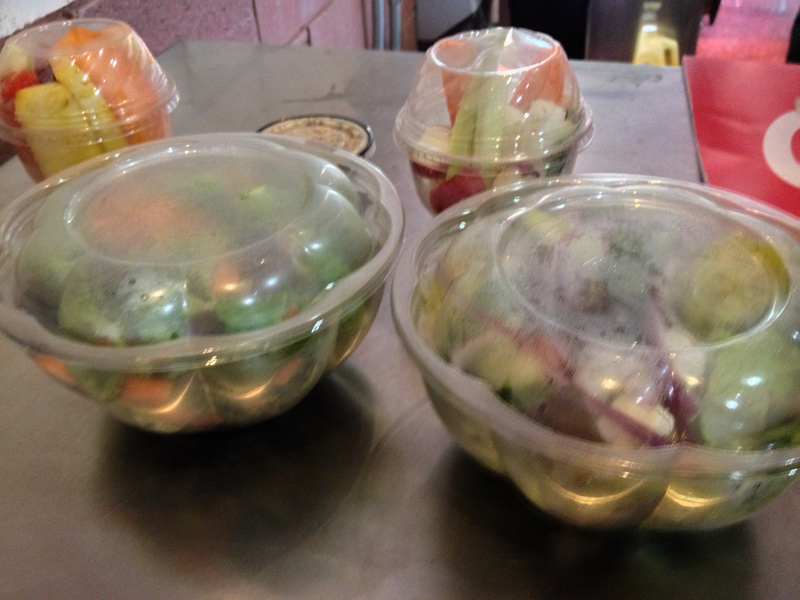 The combo platter has all three and is a lot of fresh variety for $10.25. 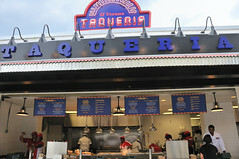 El Verano Taquería also offers “Elote,” or Mexican grilled corn. This classic street food is a steamed ear of corn dipped in a lime-spiked mayonnaise sauce, rolled in crumbly cotija cheese, and dusted with cayenne pepper for $4.75. 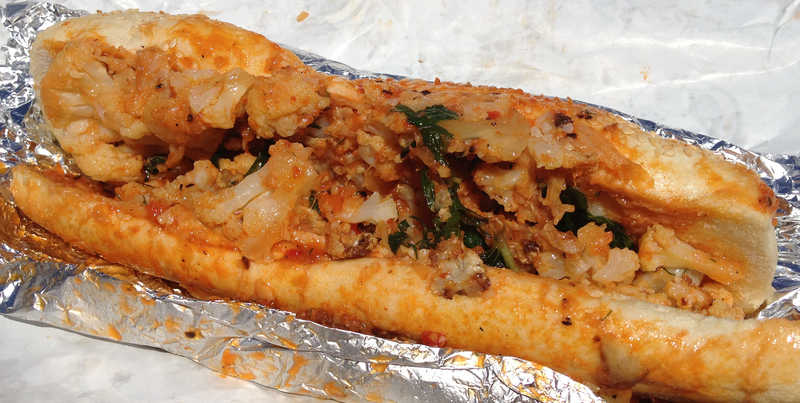 If you like your food spicy, the Elote is your best bet at the ball park. Consider yourself warned. The new restaurants facing the Miller Light Scoreboard Walk feature distinctively designed facades, and none stands out more than the new Blue Smoke Barbeque, with an attractive weathered wood veneer that’s visible over the right field stands from about half of the ball park. Nice touch. 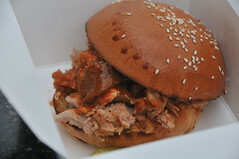 Nationals Park needed a good pulled pork sandwich to replace the departed Teddy’s Barbeque, and Blue Smoke delivers with a flavorful if slightly dry version for $8.75. Make sure to get extra sauce. There is no pulled chicken option, but you can get wings — one of the few dishes I did not manage to try. It will be interesting to see if the Barbecued Beef Bologna sandwich takes off in DC. This southern staple features pickles and raw onions atop a single thick slice of bologna that’s been grilled and topped with barbeque sauce for $7.75. 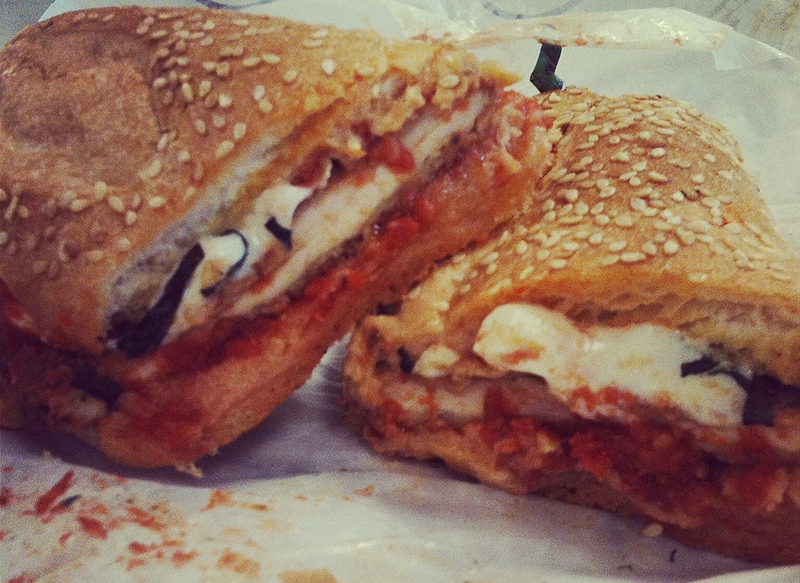 It tasted like… well.. bologna. 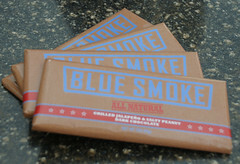 Blue Smoke’s signature item is Kansas City Spare Ribs, which were meaty and nicely carmelized. 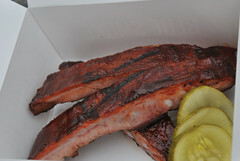 They are a fine choice, but with three modest ribs running $10.25, and relatively light on smoke flavor, it left me longing for the Rough Rider at the dear, departed Teddy’s Barbeque. at Nationals Park that’s suitable for sharing. Nationals’ COO Andy Feffer took a lot of heat today for appearing to imply that the new Scoreboard Walk was more important than the game. I find it hard to believe that any journalist actually believes that. Others have more legitimately complained that the new restaurants are not DC-centric. While I agree with the latter criticism, I can’t deny that the fan experience has been improved.